As many Insureds continue to recover from the catastrophic impacts of the 2017 Hurricane season, the imminent beginning of the 2018 season does not come as welcome news to most. 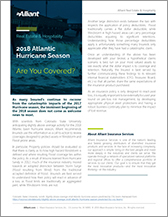 With scientists from Colorado State University anticipating slightly above-average activity for the 2018 Atlantic basin hurricane season, Alliant recommends Insureds use this information as a call to action to review coverages designed to protect assets in Windstorm and Flood prone areas. In particular, Property policies should be evaluated so that there is clarity as to how high hazard Windstorm is defined and where resulting Flood coverage lies within the policy. As a result of lessons learned from Hurricane Sandy in 2012, much of the insurance industry moved towards an adopted distinction between Storm Surge (Flood resulting from Wind) from the traditional accepted definition of Flood. Insureds are best served to understand how their policy will react in advance of a loss, as Flood limits are traditionally an aggregated peril, while Windstorm limits are not. Another large distinction exists between the two with respects the application of policy deductibles. Flood traditionally carries a flat dollar deductible, while Windstorm in high hazard areas can carry percentage deductibles equating to significant retentions. Understanding how those percentage deductibles apply is unfortunately something many Insureds only appreciate after they have had a catastrophic claim. Once an understanding of the above has been developed with your broker, a hypothetical claims scenario is best run on your most valued assets to see exactly what the dollar impact is to coverage and retention. Naturally, the Insured is best served by further communicating these findings to its relevant internal financial stakeholders (CFO, Treasurer, Board, etc.) so that all parties share the same expectations of the insurance product purchased. As an insurance policy is only designed to react post loss, it is equally important to be externally focused year round on pre-loss risk management, by developing appropriate physical asset protections and having a robust business continuity plan to minimize the impact of lost revenue. Alliant Insurance Services is one of the nation’s leading and fastest growing distributors of diversified insurance products and services. In the face of increasing complexity, our approach is simple: bring on the best people and invest more deeply in the industries and clients we serve. We operate through a network of specialized national platforms and regional offices to offer a comprehensive portfolio of services to our clients. Our goal is to ensure that they get the most innovative products—and the most innovative thinking—in the industry.